A trip to Ujjain is always very special. This time the trip had multiple causes. Firstly I had got initiated on Nityananda Trayodasi last year and I wanted to be with Guru Maharaj on this day. The second, far more joyous, reason was that my very dear friend, mentor and elder brother Sumeet Prabhu was going to get initiated along with two other senior devotees from Gurgaon, Pawan Prabhu and Pooja Mataji, on the same day. Thirdly there was a Kirtan mela at Ujjain temple and we would be able to attend atleast the 3rd day. We reached Ujjain on 11th morning. I was fortunate to get a chance to travel with Sumeet Prabhu and his family and during the trip, as always, he subtly taught me many things. 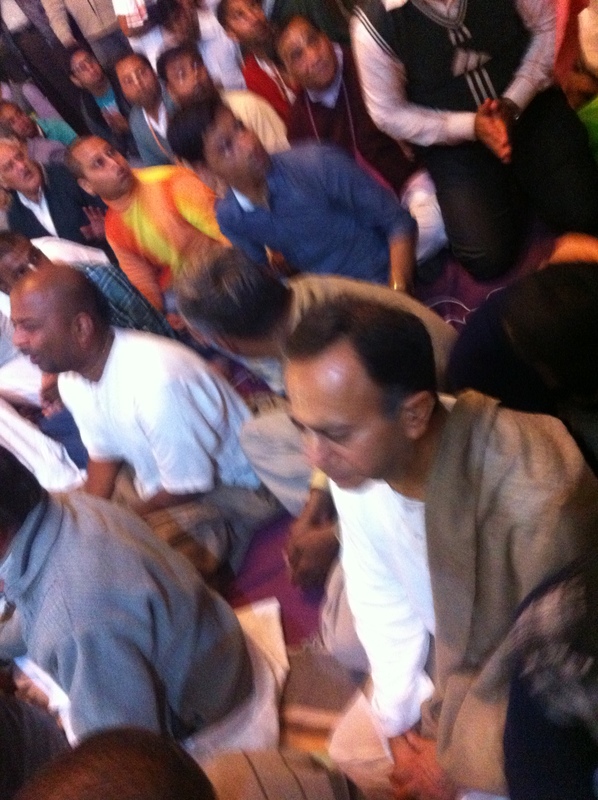 As a bonus HG Radhe Shyam Prabuji too travelled with us and in the morning I did chanted sitting with him for 3 hours. I was very inspired by his calm face and how he did his chanting with eyes closed and chanting softly. I tried to copy him by trying to close my eyes and chant but could not hold my eyes close for a more than few minutes before something or other will break my concentration. But I am going to try practicing it once I am back home. Whenever I come to any ISKCON temple I feel like a girl who has come back to her parent’s home, her `mayakaa’. As soon we reached Pooja mataji called us to hurry up as HH BB Govinda Maharaj was playing for the last time before leaving Ujjain. I hurried and reached in time to hear maharaj live for the first time, HG Madhava Prabhu and his team were playing the musical instruments. The temple hall was almost full. What a performance, it usually takes me some time to get `tuned’ into a Kirtan, especially if it is a large performance. It was within seconds that I was totally immersed in the kirtan. Maharaj has such a deep and powerful voice, after a few minutes I felt purified as if I have taken a bath in the Ganges river. The whole experience was awesome ! I sang so loudly that many a times my lungs and throat protested at such sudden enthusiasm ! It was food for my soul. After a while HH Chandramauli Swami Maharaja started dancing, he danced like a well trained dancer, dancing for the pleasure of Sri Radha Madanmohan. I felt the devdasi would similarly dance in front of Lord Jagannath. Then few more devotees followed Maharaj and then few more and in a short span the whole temple was dancing in sheer ecstasy of the Hole Name. All glories to HH Bhakti Bhringa Govinda Swami Maharaja ! Guru Maharaj came towards the end of maharaj’s kirtan, and once the kirtan was over, Guru Maharaj glorified HH BB Govinda Maharaj profusely and praised his preaching and kirtan programs all over the world. HH BB Govinda Maharaj, who was leaving for Bangladesh, too glorified Guru Maharaj. He complimented Guru Maharaj . He complimented Guru Maharaj on the magnificent temple, beautiful Deities, top class service for the Deities and then added that he has never tasted a more delicious prasadam, as he had in last 3 days, in any temple all over the ISKCON world ! He also agreed to Guru Maharaj’s request to visit Ujjain again. They both hugged each other with such affection that it brought spontaneous clapping and Hari Bol from all devotees. It was prasdam time and I was quite hungry. We had a sumptuous prasadam at the temple food hall with first class food and wonderful hospitality by local devotees. 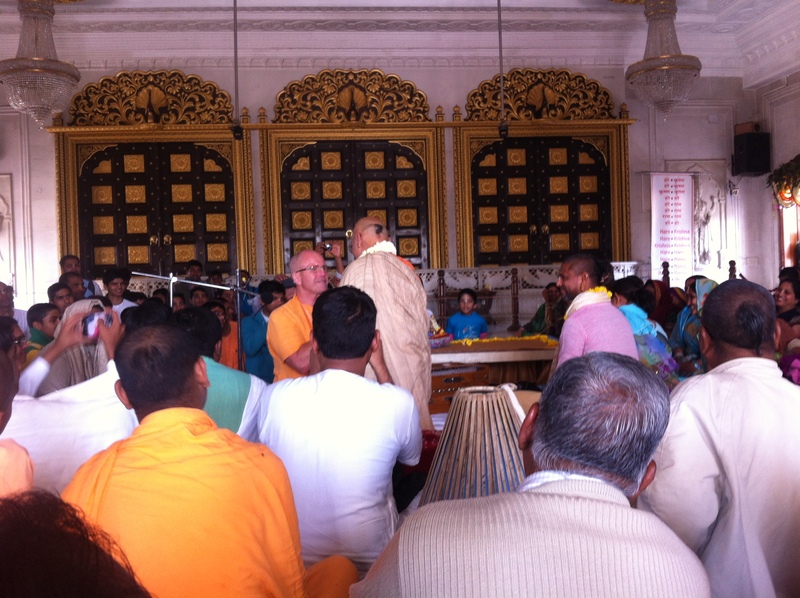 I also caught up with senior devotees from Jaipur Murari Prabhu and Vineet Prabhu, Mukunda Prabhu, so many Brahmachari’s from the temple and yet some more familiar devotees from all across the world. In just few hours I had completely forgotten that I even have a material life! The next session started at 4pm. 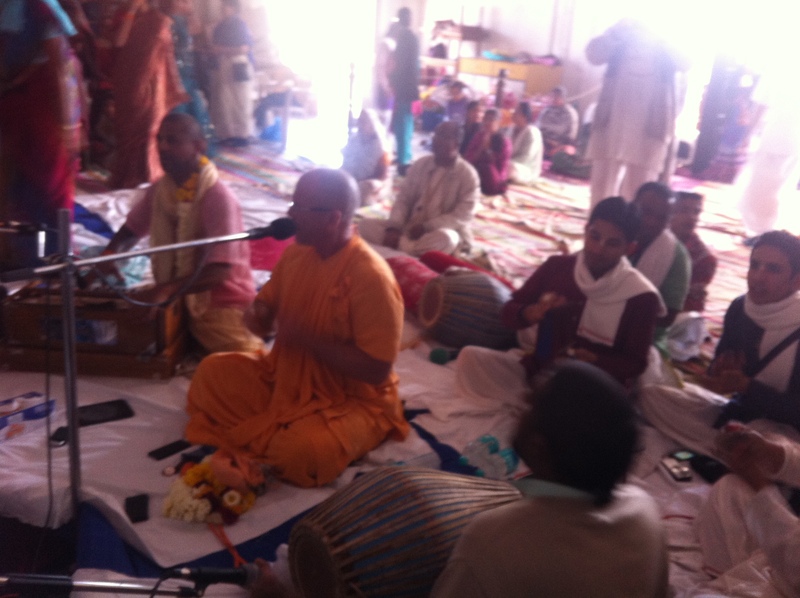 By the time I entered the temple hall it was already 5pm and HH Chandramauli Swami Maharaja was doing the Kirtan. After his excellent Kirtan for an hour it was the turn of HG Madhav Prabhu to perform. If HH BB Govinda Maharaj’s kirtan was like taking a dip in Ganges than Prabhuji’s kirtan was like being transported straight to Vrindavan. He sang slow, deep and with so much heart into it that I almost cried while singing in the Kirtan. Prabhuji has a special mercy of Aindra Prabhu on him. All glories to HG Madhav Prabhu and his team members. I was trying to click the above picture of a devotee deep in the trance of Holy name when I heard a flurry of activity on my right side. I could see in the camera frame itself that devotees were turning to greet someone. As I hastily turned, and my phone shook to get the above hazy picture, I saw Guru Maharaj walking in with his ever enchanting smile. Guru Maharaj was back in the temple ! After HG Madhav Prabhuji’s kirtan was over Guru Maharaj glorified and thanked him for such wonderful kirtan and how they are so popular throughout the world. They too were all praise for Guru Maharaj and the temple. The Last session of the Kirtan Mela was led by Guru Maharaj. What can one say now! Guru Maharaj started with a slow pace and then picked up the beats. 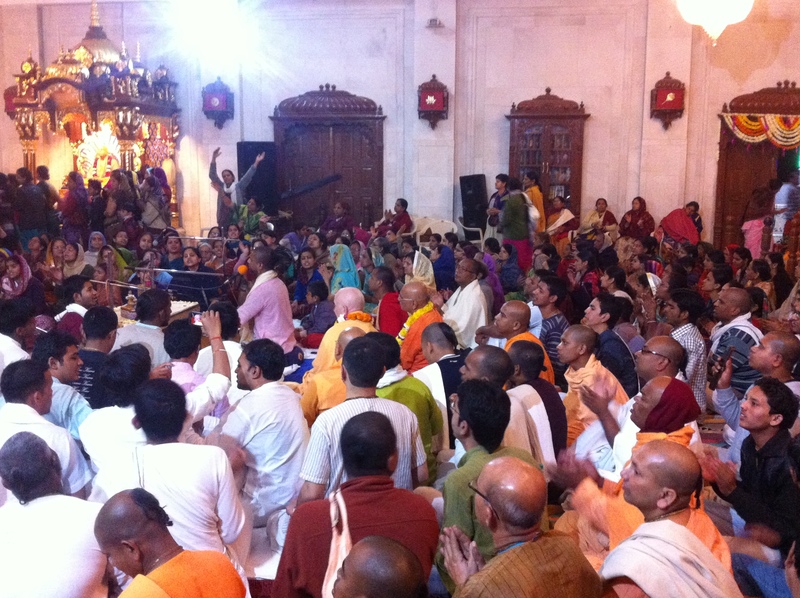 For the fourth time in the day the whole temple was again dancing jubilantly. Devotees won’t let Guru Maharaj stop the Kirtan! Children, women, elders, everyone was dancing on the tune of Guru Maharaj. After the ecstatic kirtan Guru Maharaj gave a brief but serious lecture on the importance of Hari Nama. He said that the whole purpose of organising the Kirtan mela was to attract people to chant of the Holy name of the Lord. By hearing just one full day of kirtana I felt as if my soul is satiated till its very core. It was already 9.15 pm and we all had another dose of sumptuous prasadam. After spending some time with Vineet Prabhu, I retired to my room around 11.45pm. All glories to the Kirtan mela. This entry was posted in Guru, ISKCON, My spiritual Journey and tagged Bhakti Charu Swami, Guru maharaj, HG Madhav Prabhu, HH BB Govinda maharaj, HH Bhakti Bhringa Govinda Swami maharaj, HH Chandramauli Swami Maharaja, ISKCON Gurgaon, ISKCON prasadam., ISKCON Ujjai, Kirtan iskcon, Srila Prabhupada, Ujjain kirtan mela 2014. Bookmark the permalink. I have no words to express my feeling. This blog has totally replayed the movie in my mind of my last year visit to Ujjan. Thank you very much prabhu ji.